The National Restaurant Association in fall 2013 surveyed about 1,300 chefs (members of the American Culinary Federation) to find out what they believed would be the hot trends in 2014 and the coming months in food, beverages, cuisines, and culinary themes. 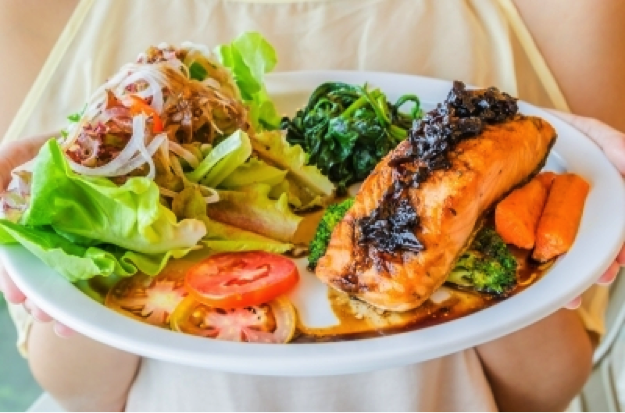 If you’re serving seafood such as salmon, the trend today – what your customers want – is to absolutely make sure it’s freshly caught and, if possible, caught locally. These cuisine trends lead naturally to design trends for your space. We’ve found that diners today want an “authentic” experience to go along with their “authentic” meals. This means they’re more willing to share this experience with their fellow diners, calling for a more open and communal dining experience (for Millennial-aged diners, in particular). Hence, some restaurants are opting for communal dining tables. Designing a space so that the kitchen is open – without causing a distraction for your chefs and cooks – and a focal point for the restaurant, also is becoming more popular. Openness and communal dining also are seeing a growth in what is known as a “fast casual,” environment, allowing customers to also see their food being prepared as they order it (think Chipotle Mexican Grill restaurants). So what does this mean when it comes to these trends influencing restaurant design today? If your restaurant provides services to an upscale clientele, be aware that they’re looking for a more causal feel as they dine. Seriously consider hiring an interior designer, particularly one – such as Jones Baker – who has considerable experience designing restaurant spaces. Whomever you choose to help design your space, make sure he understands how restaurants operate – how food flows from kitchen to your diners’ tables. He should understand this flow from both your employees’ as well as your customers’ point of view. For more information on Jones Baker’s restaurant design expertise, give us a call at 214-426-5600 or send us an e-mail via our online contact form.